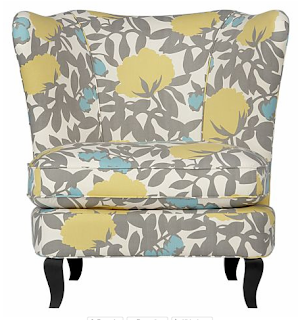 I used to have a slight obsession with upholstered chairs that began when I first moved into my own place without roommates. Then I realized that an upholstered chair wouldn’t fit in my living room if I still wanted to have room to be able to walk around without having to crawl over everything. That was when the obsession died down. But then, this past Sunday, as I was glowing with the thrill of my new purchase — a pair of Oxo kitchen tongs — I spied this chair in the Crate and Barrel window and the obsession began all over again. Does it not make you want to sit on it whilst enjoying a tall glass of iced tea, contemplating what the grass will look like and what the night air will feel like in the summer? Ohhh, I love it too! 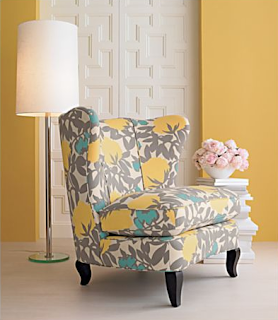 I'd be happy to decorate a whole room based on the pretty colors and print of this chair. P.S. I just misspelled my own name. P.P.S. I reeeeeeally love looking at the contrasting black legs on this chair. So cute! That is breathtaking. I soooo want to have a life in which beautiful chairs dwell, from which I can contemplate the grass. Crate and Barrel is a cool store.